Waterfalls and fountains can add a natural essence of beauty to your home exterior. As a custom builder, One World Builders will work with you, the landscaper and architect to design a fountain or man-made waterfall that will naturally blend with your home. Listed in this category are pictures of custom man-made waterfalls and fountains of two homes that One World Builders has built. Man-made waterfalls when properly built, can be aesthetically pleasing to the eyes. The sound of the water falling over the rocks and into the pool can have a calming effect to all your guests as they are entering your home. Waterfalls professionally built and designed can blend into the landscape and give your home a touch of class and beauty. Fountains have been used for thousand of years and were first used in the Middle-East as a cool place to escape from the hot sun of the desert during the summer months. The Persians and Romans developed complex architectural designs that included pools and public baths. 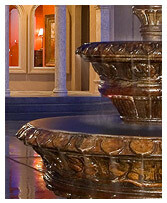 Today, a custom fountain as part of the landscape can enhance the look and feel of the home itself. One World Builders has built many different types of homes in order to meet the different aesthetic tastes of our clients. Listed below are small thumbnail images of some of the many designs of fountains and waterfalls. Click on the image that you preferred to view and it will take you to a larger version with information about the photo. 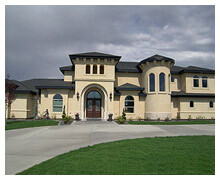 *Please Note: The photos above were photographed from many different styles of custom homes located in in Boise, Twin Falls and other locations in the state of Idaho. As a home builder, One World Builders places importance in the quality craftsmanship and aesthetic design of a custom built home. We want to make sure that our client needs our met in the building of their home. To setup an appointment to discuss building your new home in Idaho as well as internationally, please contact us at 208.280.3333. Corey Schoenauer, the owner, will gladly assist you.